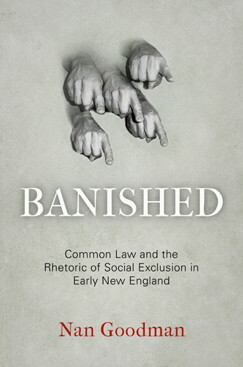 This July, University of Pennsylvania Press published Banished: Common Law and the Rhetoric of Social Exclusion in Early New England by Nan Goodman (University of Colorado). The publisher’s description follows. A community is defined not only by inclusion but also by exclusion. Seventeenth-century New England Puritans, themselves exiled from one society, ruthlessly invoked the law of banishment from another: over time, hundreds of people were forcibly excluded from this developing but sparsely settled colony. Nan Goodman suggests that the methods of banishment rivaled—even overpowered—contractual and constitutional methods of inclusion as the means of defining people and place. The law and rhetoric that enacted the exclusion of certain parties, she contends, had the inverse effect of strengthening the connections and collective identity of those that remained. Banished investigates the practices of social exclusion and its implications through the lens of the period’s common law. For Goodman, common law is a site of negotiation where the concepts of community and territory are more fluid and elastic than has previously been assumed for Puritan society. Her legal history brings fresh insight to well-known as well as more obscure banishment cases, including those of Anne Hutchinson, Roger Williams, Thomas Morton, the Quakers, and the Indians banished to Deer Island during King Philip’s War. Many of these cases were driven less by the religious violations that may have triggered them than by the establishment of rules for membership in a civil society. Law provided a language for the Puritans to know and say who they were—and who they were not.Banished reveals the Puritans’ previously neglected investment in the legal rhetoric that continues to shape our understanding of borders, boundaries, and social exclusion.